(File photo — Jerret Raffety/Rawlins Daily Times, File) Male sage grouses fight for the attention of female southwest of Rawlins, Wyo. The Interior Department announced Thursday it plans to reverse restrictions on up to 10 million acres originally intended to protect the bird — including 231,000 acres in Utah. WASHINGTON • The Interior Department said Thursday it is withdrawing protections for 10 million acres of federal lands used by the threatened sage grouse to open it up for energy development. The plan would allow mining and other development in areas where it now is prohibited in six Western states: Idaho, Montana, Nevada, Oregon, Utah and Wyoming. Utah‘s share of that now-reversed mineral withdrawal affected 231,000 acres in Box Elder, Cache and Rich counties. The Bureau of Land Management, an Interior agency, said a recent analysis showed that mining or grazing would not pose a significant threat to sage grouse, a ground-dwelling, chicken-like bird that roams across vast areas of the West. The proposal would affect less than one-tenth of 1 percent of sage grouse-occupied range across 11 states from California to the Dakotas, officials claimed. 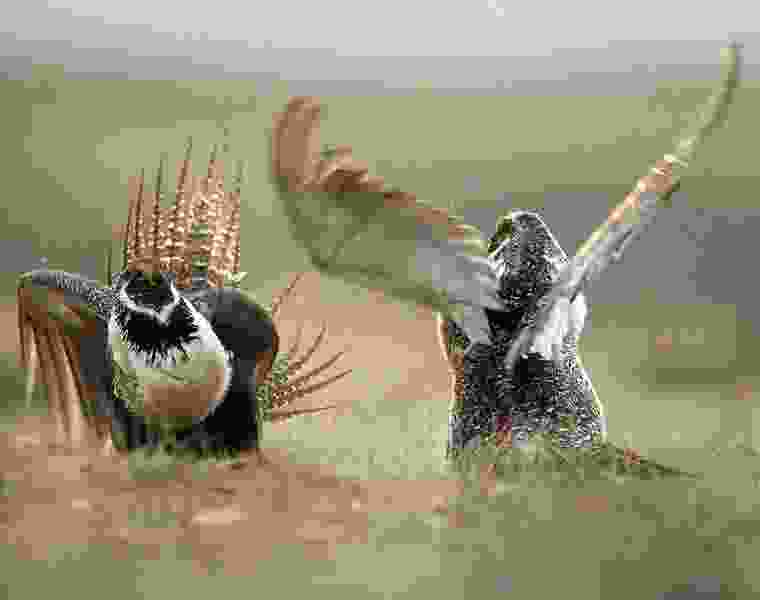 The change comes as the Trump administration moves to reconsider an Obama-era plan to protect the sage grouse, a quirky bird with long, pointed tail feathers and known for the male’s elaborate courtship display in which air sacs in the neck are inflated to make a popping sound. Last year, Utah and energy interests sued to invalidate the plan, arguing it had little scientific basis and ignored Utah’s own conservation plan tailored to the state’s geography where habitat is scattered in isolated patches, as opposed to the “sagebrush seas” covering much of Nevada and Wyoming. These efforts imposed restrictions that were “unnecessarily draconian,” and disregarded measures energy companies implemented to protect sage grouse, according to Kathleen Sgamma, president of the Western Energy Alliance. But Interior under then-Secretary Sally Jewell had downplayed the plan’s impact on energy development. She claimed that oil and gas inventories indicated little overlap between medium-to-high-potential areas with “priority habitat,” the lands where her plan imposed “no surface occupancy” drilling stipulations. And these rules did not apply to pre-existing leases. Utah Rep. Rob Bishop said the Obama administration’s mineral withdrawals were never about conserving the sage grouse. Millions of sage grouse once roamed the West but development, livestock grazing and an invasive grass that encourages wildfires has reduced the bird’s population to fewer than 500,000. The Obama administration’s call to protect 10 million acres from development “to prevent 10,000 (acres) from potential mineral development was a complete overreach,” said acting BLM Director Mike Nedd. He and Interior Secretary Ryan Zinke pledged to work closely with states to protect the health of the sagebrush-dominated lands. Interior said Thursday it is seeking comment on plans to revise sage-grouse conservation plans across the bird’s range. Environmental groups said Interior was jeopardizing the bird’s habitat — and its survival. “The Interior Department is traversing down a dangerous path that could put this vital habitat at risk,” said Nada Culver, a policy expert at The Wilderness Society. Because of the importance of its sagebrush habitat, the sage grouse helps determines the health of an entire ecosystem, including the golden eagle, elk, pronghorn and mule deer, Culver said. A 2015 plan imposed by the Obama administration has reduced the threat of extinction by protecting the most important habitat while ensuring other activities continue on public lands, she said. The 2015 plan was hashed out under President Barack Obama as a way to keep the bird off the endangered species list following a decades-long population decline caused by disease and pressure on habitat from energy development, grazing and wildfires. Zinke ordered a review of the Obama plan this summer, saying he wanted to give Western states greater flexibility to allow mining, logging and other economic development where it now is prohibited. Zinke insisted that the federal government and the states can work together to protect the sage grouse and its habitat while not slowing economic growth and job creation. Mining companies, ranchers and governors in some Western states — especially Utah, Idaho and Nevada — said the 2015 plan would impede oil and gas drilling and other economic activity. Republican governors in those states urged that conservation efforts focus on bird populations in a state rather than on habitat management, which frequently results in land-use restrictions. On the other side, Democratic Gov. John Hickenlooper of Colorado and Republican Gov. Matt Mead of Wyoming have said they oppose any changes to the habitat-management model. John Swartout, a senior adviser to Hickenlooper, said changes to the conservation plan — developed over years with local and state involvement — could lead to a future Endangered Species Act listing for the sage grouse. “We didn’t work this hard to throw it all away and get a listing” on the Endangered Species Act, Swartout told The Daily Sentinel of Grand Junction, Colo. Comments on the plan will be accepted through late November. — Tribune reporter Brian Maffly contributed to this report.